Concorde (note: the aircraft’s name is not “The” Concorde) featured a maximum speed of Mach 2.04 with seating for 92 to 128 passengers. First flown in 1969, it entered service in 1976 and continued commercial flights for 27 years. The first commercial flights took place on January 21 1976 on the London–Bahrain and Paris–Rio (via Dakar) routes. When the British government established the Supersonic Transport Aircraft Committee in 1956 to explore the possibility of developing the world’s first passenger aircraft able to fly faster than the speed of sound, it could take as long as eighteen hours for a commercial jet to fly from London to New York. It was to take nearly twenty years for the committee’s work to culminate in the first commercial flight of a supersonic aircraft, but the subsequent performance of that jet, Concorde, exceeded even the most optimistic expectations. Routinely flying faster than twice the speed of sound, Concorde sported a take-off speed of 250 mph (400 kmph) and a cruising speed of 1,350 mph (2,160 kmph) at an altitude of up to 60,000 feet, twice the height of Mount Everest. At its fastest on 7 February 1996, Concorde flew from New York to London in just 2 hours, 52 minutes and 59 seconds, less than a sixth of the time that the same journey would have taken by air in 1956. 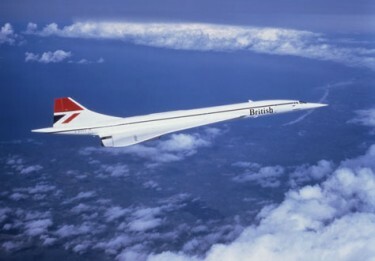 Hailed for its beauty as well as its speed, Concorde seemed to belong less to the modern world than to the future. During 27 years of commercial service from 1976 to 2003, it became one of the best-loved engineering design projects of the 20th century. An exemplar of technological excellence, Concorde struck such a strong emotional chord with the public that children cheered whenever they spotted it in the sky.